Yarmuth to protest at Farm Bureau Breakfast - We Resist. 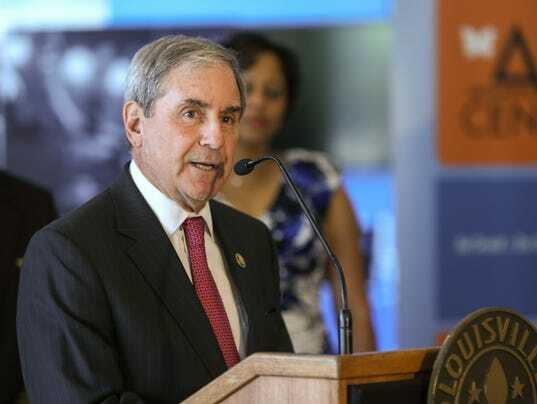 U.S. Rep. John Yarmuth will be protesting outside the Kentucky Farm Bureau Ham Breakfast on Thursday, rather than hosting people at a table inside. Yarmuth, who had purchased a table at the event for the previous nine years, said he is making the change because he is concerned by political stands the bureau has taken on a range of issues — including the rights of gays and lesbians to marry — that he doesn’t believe have anything to do with the agricultural focus of the organization. “I just don’t think they should be involved in these issues that are unrelated to farming,” he said. Also attending the protest organized by the Fairness Campaign will be former Louisville Metro Council member Attica Scott, who is running for state representative and faces no opposition. Nancy Jo Kemper, the Democratic nominee for Congress in Kentucky’s 6th District, will also attend, according to her campaign manager, Sellus Wilder. He said Kemper “disagrees with just about everything” in the farm bureau’s social justice agenda. Last year at the event, state police arrested three members of the Fairness Campaign who had protested outside and then stood in silent protest during the huge annual breakfast. A prosecutor dismissed the charges after deciding a conviction was unlikely. The three then filed suit against the troopers, claiming they were falsely arrested and maliciously prosecuted. That suit is still pending in U.S. District Court. Yarmuth said that since then, he has told Farm Bureau leadership that he would boycott the breakfast if it didn’t back off some of its non-agricultural positions. Todd Bright, a spokesman for the Farm Bureau, didn’t respond to Yarmuth’s call for a change in positions but said in a statement that politicians are always welcome at the breakfast. Following the breakfast, the state fair’s grand champion ham will be auctioned, with the proceeds going to charity. More than $10 million has been raised over the years, Bright said. Yarmuth said his conversations with the Farm Bureau went nowhere. “They were very pleasant and polite, but they don’t seem concerned about changing their positions,” he said. Among the Farm Bureau positions the Fairness Campaign opposes are its opposition to gay marriage and domestic partner benefits, its opposition to abortion, its opposition to mandated collective bargaining for government workers and its belief that students should not be taught about alternative lifestyles in public schools. The Fairness Campaign also opposes the farm bureau’s support for so-called Right to Work legislation and the death penalty and its opposition to raising the minimum wage and repeal of a state prevailing wage law for public projects. And the group doesn’t agree with the Farm Bureau’s opposition to allowing public employees to strike and to the unionization of farm laborers. Yarmuth said he has no plan to go into the hall where the breakfast is held and that he has absolutely no plans to be arrested, as the three protesters were last year. Chris Hartman, director of the Fairness Campaign, and one of those arrested last year, said that the group simply plans to hand out literature and stickers outside the building. He said some members will attend the breakfast. “We’ll just be there, enjoying our breakfast with a bunch of state troopers hovering over us, I suspect,” Hartman said. Reporter Joseph Gerth can be reached at (502) 582-4702 or jgerth@courier-journal.com.